Award-winning author Madge H. Gressley, lives in the Mid-west with her granddaughter, great-grandson and two dogs. She has been an award-winning visual artist for over 30 years, but in 2013 she made a life-changing decision and traded her paintbrushes and canvas for paper and pen but, in this case—computer and keyboard. Gressley works from home where, during the daylight hours, she is co-owner in a graphic design business. Evenings find her at her trusty computer writing away. Gressley’s most recent awards: 2018 Independent Press Book Award Winner—Young Adult Fiction category for “The Secret of Trail House Lodge.” Distinguished Favorite in the 2018 Independent Press Book Award for “Inescapable ~ The Beginning,” which was also selected as a Finalist in the 2017 Book Excellence Award, Romance category. “Inescapable ~ Remembering” has been selected as a Finalist in the 2018 Book Excellence Award—Romance category. Both competitions are international. 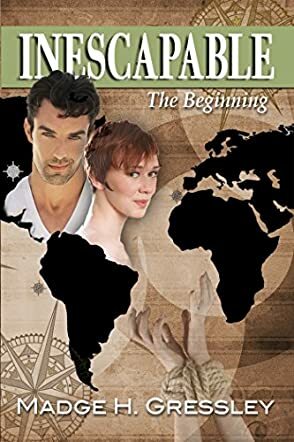 Inescapable —The Beginning by Madge H Gressley is a suspenseful romance with strong elements of espionage, murder, and human trafficking. Brad Daniels, the man Darcey Callahan loves more than life itself, has been called back to Peru to deal with a dangerous situation in his job. Believing him to be missing when she fails to get information about him, Darcey sets out to find Brad, but something terrible happens. She is in a car accident and wakes up without memory. What makes matters worse is that she finds herself in the hands of people who will hold her captive in Morocco while waiting to sell her. When Brad finally comes to rescue her, will she recognize him and what can he do to win her trust and make her believe he is the man she loves deeply? This is a beautiful story with a strong story line, great prose and well-crafted characters. The author wastes no time introducing the conflict, the fact that Darcey can’t live without knowing where Brad is. Madge H Gressley introduces strong elements into the plot and the peak is when Darcey wakes up from an accident with memory loss and in the hands of the very bad guys. The reader wants to know what happens next as they turn from page to page, spurred on by the suspense created by the relevant shifts in points of view. The cunning in-depth plot, the balance in writing, and strength of character development are elements that make Inescapable —The Beginning an enjoyable read. Darcey is my favorite character and I enjoyed how her humanity and vulnerability are explored in the narrative. Darcey had found the man of her dreams in Brad. He lit a fire in her like no one else could. But Lily's appearance in their life had indicated trouble. Darcey knew very little about his job, only that it was 'classified'. When Brad told her he had to return once more to sort out some trouble, she knew from his expression there was more to it than that, and she was worried. It seemed her instincts had been right on the mark. Brad goes missing, and Darcey moves mountains in an attempt to track him down, unaware that she is playing directly into the enemies' hands. After a horrific traffic accident, being kidnapped and drugged, her mind shuts down, robbing her of all memories. The only thing she knows for sure; she's being held against her will. Can she find the strength to escape, will she recover her forgotten memories, and can Brad find her before a fate worse than amnesia befalls her? Unravel the mystery in Madge H. Gressley's Inescapable ~ The Beginning. Mystery fans and those who enjoy a good tale of intrigue will certainly find Madge H. Gressley's Inescapable ~ The Beginning ticks a lot of their boxes. There is some great character development, complex relationships, betrayal, hope, devastation, suspicion, a hint of honour among 'thieves', and romance, all creating a foundation for the next book in the series. Inescapable ~ The Beginning is a good first book with plenty to keep a reader entertained. You'll be drawn into the plot and find yourself rooting for the characters and watching their relationships change and grow, shaped by their experiences. There are parts of this book, and the interactions between the characters that feel very real, and thus create a good atmosphere. An enjoyable read that will make many readers want to pick up the second book.